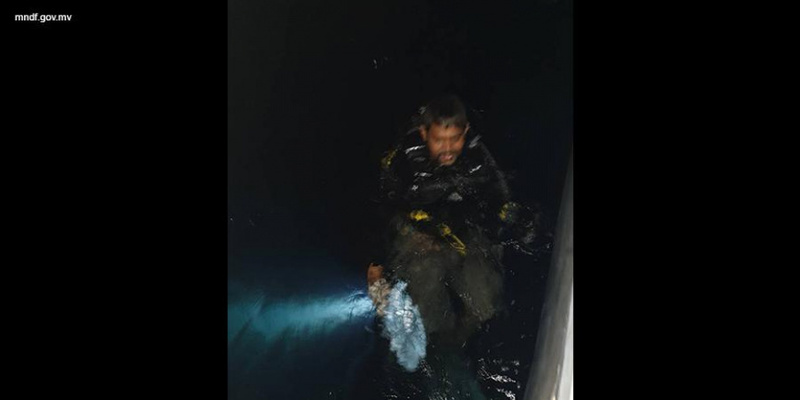 Maldives National Defense Force (MNDF) has rescued a lone diver reported missing after diving into the waters outside Hulhumeedhoo, Addu City in search of sea cucumbers. Ibrahim Shakeeb from Fehivina at Hithadhoo, Addu City was reported missing at 11:14 pm last Friday night. MNDF reports a team from its Southern Area Coastguard Squadron was immediately dispatched to locate and rescue the man. The team managed to locate the man at 11:39 pm, one-mile to the East of Hulhumeedho. The man went missing after he surfaced far away from the boat and got swept away in the tide.